optional additions at this point: sections of fresh cara cara orange, sections of grapefruit, cubes of avocado, or dried apricots. NOTE: my recipe is based loosely on russ parsons’ (food editor of the L.A. TIMES) recipe, but adapted for baker & olive products, the surplus of kale in our garden and our absolute love of hazelnuts and gorgonzola. 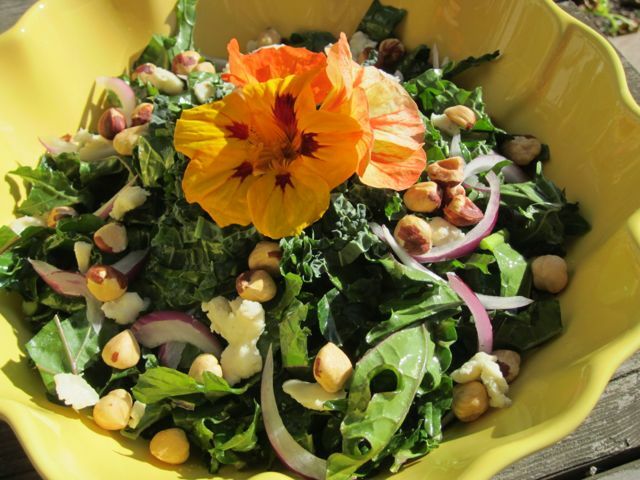 This entry was posted in salad and tagged grapefruit white balsamic, hazelnuts, hearty, kale, superfood by Elena. Bookmark the permalink.